This is Oreo. He’s a raccoon, and is pretty much the brains of the whole operation. Okay, so Oreo and Friends isn’t all about Oreo (despite what he may think) but he is the reason it began! You see, when Oreo first came to us, he was extremely young and sickly (you can read more about his story here). He needed constant, round the clock care, and this meant we had to take him with us everywhere we went! Obviously, it’s not every day you see someone walking around nursing a baby raccoon, and inevitably Oreo attracted a lot of attention. He was mistaken for every animal under the sun – people thought he was a ferret, a badger, even a monkey! But whether they knew what he was or not, everyone Oreo met wanted to know more about him, and about raccoons in general! But most importantly, we quickly learned that Oreo absolutely adored meeting new people. He relished the attention he received, and to this day loves nothing more than making new friends to play with, especially when they come with handbags to delve around in! 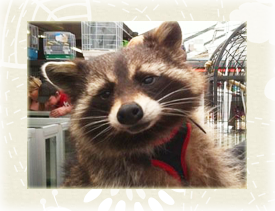 Before long Oreo gained strength and grew up into a happy, healthy raccoon, and he even started to get a bit of a name for himself – he attracted the attention of radio and television shows, and even became Rocket Raccoon! He brightened the day of everyone he met, and what’s more, he encouraged people to learn more about exotic animals! Exotic awareness has always been important to us, particularly when it comes to rallying against the improper keeping of these animals, and it soon became obvious that we were being handed an opportunity to educate people. We realised that a lot of our other exotic animals were beginning to follow in Oreo’s footsteps by showing the same affection for new people, and it was then that the idea to create Oreo and Friends Animal Encounters was born! What could be more perfect – giving people the chance to interact with animals they may never have even seen before, allowing our animals to be showered with the love and attention they adore, and raising awareness for exotic animals…all at the same time! So, that’s our story. If you’re interested in learning even more about us and what we do, feel free to click any of the links below! These phenomenal paintings of Oreo were created by the very talented Drusilla, who is much loved by Oreo and Friends! Please consider visiting her store to see more of her incredible work!